It had the semblance of a play lacking key actors. They were deemed the difficult ones, and a decision was made to go through with the performance. The Taliban were willing to talk with their adversaries, but they were keen on doing so with opposition politicians rather than the stick-in-the-mud types in government led by the current President Ashraf Ghani. The assessment from The New York Times over the whole affair held at the President Hotel in Moscow was that the meeting could only be, at best, “a brainstorming session”. The Taliban officials going to Moscow were a different crew, at least in terms of perceptions. These were not the intemperate salad day youths of 1996, yanking cassettes from car stereos in Kandahar and ranting against all matters musical and female. These were men of diplomacy, their guns holstered. Gone were visions of seizing the whole of Afghanistan and establishing a broader theocratic state. Doing so, by their admission, would not bring the state to peaceful order. Nor, and here there will be questions, did they seem unwilling to reconsider their position on broader notion of human rights. The claims from the Taliban demonstrate their continued boldness and durability. Enemies have come and gone, and they remain steadfast in imposing order. Their brutality remains common and assertive, but they have become wiser, more discerning in their heavy-handedness. “Peace is more difficult than war,” suggested Sher Mohammad Abbas Stanikzai, one of the members of the negotiating party to head to Moscow. The January draft agreement arising from a series of meetings with US Special Envoy for Afghanistan Reconciliation, Zalmay Khalilzad, suggests a commitment on the part of the US to withdraw its forces from the country with a Taliban promise to prevent Afghanistan being used as a staging ground for jihadists in future. The Wednesday statement did little to add flesh to any potential bargain but did outline nine points. Continued intra-Afghan talks would take place – the usual talks about talks; involving the cooperation of regional countries and others were “essential to determine lasting and nationwide peace in Afghanistan”. Ghani was even blunter: “With whom, what will they agree upon there? Where is their executive power? Let hundreds of such meetings be held, but these would only be paper (agreements) unless there is an agreement by the Afghan government; Afghanistan’s national assembly and Afghanistan’s legal institutions.” Ghani might as well have asked himself those same questions, his rule itself very much a paper based one, his claims to executive authority adventurous at best. 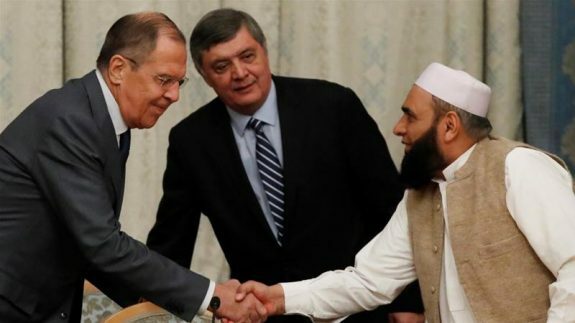 Notwithstanding the activities in Moscow, there will no doubt be a good number of Afghans, left confused by years of external intervention and promptings, concerned by this affirmation and legitimation of Taliban rule. While the Moscow declaration insists on observing various rights previously anathema to Taliban theocracy, these are provisional within the remit of “Islamic principles”, which have been shown to be roughly interpreted when needed. Schools may continue being threatened under any new regime; education for females face the prospects of being reined in (religious reasons apply, naturally), as they always tend to in areas of Taliban occupation. Aired guarantees are simply that. The gathering in Moscow signalled one undeniable reality: the Taliban as a political force cannot be ignored. Remarks made in the immediate aftermath of the invasion of Afghanistan in 2001 by US-led forces that the Taliban would be blown to smithereens and wiped off the lunar face of the country have come to nought. These fighters have lasted the distance; corrupt officials in Kabul, pampered and sponsored by foreign largesse, remain estranged and politically weak. The Trump administration, prone to erratic spots of unilateral viciousness, is keen on easing part of the imperium’s commitments in the Middle East. Eyes will be on Kabul to see how far this goes. Meanwhile who is in control of the natural resources of Afghanistan?